Yesterday I mentioned that some familiar faces cashed $25,000 checks in MLB 2K13's Million Dollar Challenge, including a guy accused of cheating in last year's contest. But I missed another important name: The man who blew the whistle on the scandal. Scott Young, edged out of a shot at a million-dollar prize last year by an exploit of both the game's code and a loophole in the contest rules, found justice this spring. Under a new contest format that awarded 30 players $25,000 each, Young cashed in by throwing the contest's top-rated perfect game with the Chicago White Sox. "It almost felt to me like they were compensating for last year, even though I know that's not what happened," Young told Kotaku. Last year, more than 900,000 gamers attempted to throw a perfect game—a game in which one pitcher pitches a complete game without allowing a single baserunner—to qualify for an eight man tournament in New York, with a $1 million prize on the line. Young befriended one qualifier over Xbox Live, who showed him how to stock the opposing team's lineup with weak hitters off the bench, while still generating a code that certified a legitimate performance. Young did not use the exploit in throwing his qualifying game, whose score ultimately was pushed out of contention. 2K Sports dismissed allegations of cheating and concluded the contest with at least one finalist there by virtue of the exploit. "I told myself this year that if they hadn't fixed the exploit, then I was going to take it right back," Young said. "I wasn't going to deal with that, because it did not involve any skill, whatsoever." 2K Sports did fix the exploit this year, and the contest's new format—which split up the prize pool over many more winners—was enough to bring Young back to something that had been so embittering the year before. "The biggest thing for me coming back was I know I could do it," Young said. "I knew I had that shot to win some cash, just playing a game." 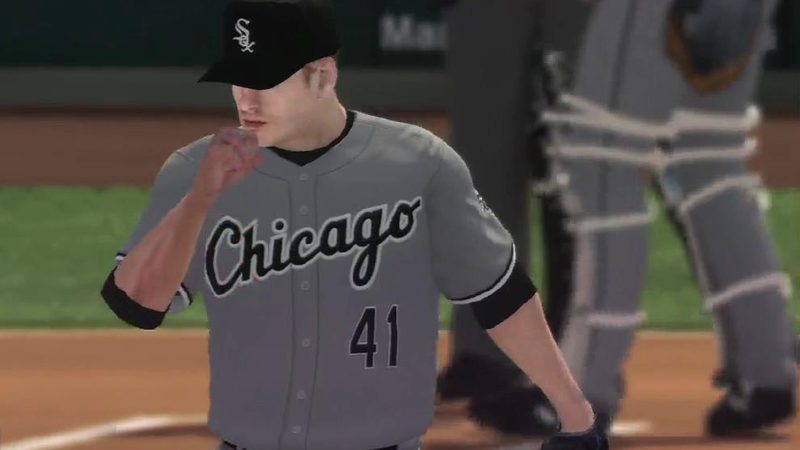 Young had, after all, thrown a perfect game with MLB 2K12 in the contest, and this year's game changed only minimally, and is almost identical in gameplay. "I'd come home from work, and my girlfriend has been so cool about this," Young said, "I have a daughter, she would take my daughter to the park and give me the living room. Every day she gave me that. "With about two weeks left, I really thought about quitting," Young said. "She said, 'You know what, take the day off, settle down, and see how you feel." He came back that night and threw a perfect game with Blake Beavan of the Seattle Mariners, putting him atop that team's leaderboard. Finally, a week before the contest ended, Young threw a 14-strikeout perfect game against Cleveland with Dylan Axelrod of the White Sox. It was good for a score of 781, and Young hung on through the final five days without anyone surpassing it. "People would say, 'Oh that's awesome! You're going to win!' and I said, 'No, remember what happened the last time; I got bumped out at the last minute.'" He didn't this time, and everything, as far as anyone can tell, was contested fair and square. As soon as Young was confirmed as a $25,000 winner, he went to a financial advisor at his local bank. He and his girlfriend have a second child on the way, and the money, properly managed, can certainly help with those expenses. "It's almost scary getting this amount of money," he said. "It's not a huge amount, but it is nice, and I don't want to screw it up and blow it." Young also is in better shape now than if he had gotten a final round berth last year, which didn't guarantee anything other than a nice trip to New York City. The million-dollar prize pool was a winner-take-all deal last time. "The new format is a huge reason why I wanted to compete," Young said. "I thought I was going to get two or three top perfect games," he said, "but I knew I would throw at least one."